TRON is a highly ambitious project aiming to establish a truly decentralized Internet. If you’re wondering what that involves or simply “What is Tron?” then you have come to the right place as this guide is packed full of useful info. The TRON protocol is among the biggest blockchain-based operating systems worldwide, is highly scalable, has high throughput, and is able to support a wide range of decentralized applications in its ecosystem. TRON also acquired BitTorrent in July 2018 to further its mission of creating a decentralized ecosystem. TRON’s native token TRX is currently the world’s 10th largest cryptocurrency with a market cap of more than $1.5 billion (as of March 10, 2019). Tronix or TRX is the native digital currency of the Tron blockchain. It first came into existence when Tron launched a successful ICO which raised over $70 million in September 2017. At the time, TRX was a token designed on the ERC20 protocol. As the Tron blockchain matured, so did the TRX token. Less than a year after its ICO, Tron launched its mainnet which led to a token migration from the ERC20 TRX token to the new mainnet TRX coin. Note: TRON activated its mainnet on June 25th, 2018 and celebrates this date as TRON’s Independence Day. Tron is still collecting the ERC20 tokens and burning them so that eventually the only TRX tokens in existence will be the mainnet version. 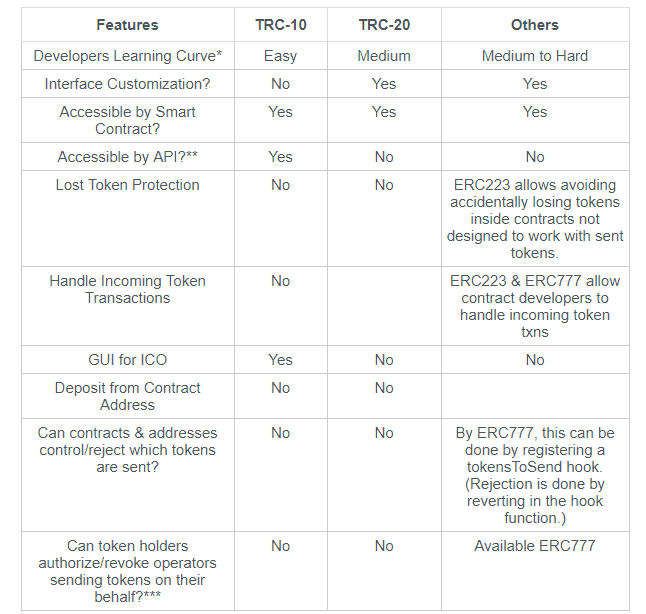 What are TRC-10 and TRC-20 Tokens? Custom TRC-10 tokens can be made and issued on the TRON Network for the cost of 1024 TRX tokens. The creators do not need any programming knowledge, and the whole process is very easy to complete. A well-known example of a TRC-10 token would be the BitTorrent token (BTT). TRC-20 tokens can support smart contract implementation using the Tron Virtual Machine (TVM). It is fully compatible with ERC-20 tokens and therefore enables developers to port their Ethereum contracts over to Tron. Smart contracts offer unlimited possibilities, and TRC-20 tokens are able to implement extra logic that is not possible with TRC-10 tokens. However, TRC-20 tokens are more complicated to set up than TRC-10 tokens. A well-known example of a TRC-20 token would be ANTE which is used on the popular TRONbet platform. TRX is short for Tronix and is the official native cryptocurrency of TRON. TRX works in several ways. Being the de facto token of the Tron economy, it can be used as a medium of exchange, as an investment and as a bridge currency between different platforms and other Tron tokens. TRX utilizes blockchain technology, and transactions are done peer-to-peer. TRX transactions are fast and have low fees. It can be found on numerous exchanges as discussed in detail below and is currently the 10th largest cryptocurrency worldwide. What Are the Main Functions Of TRX and Its Use Cases? TRX is the main medium of exchange in the Tron ecosystem. This includes payment for or earnings from the 100’s of Tron-based decentralized applications (DApps). TRX can be sent or received by anyone who has a Tron Wallet anywhere in the world. It can also be used to pay for goods and services as a form of digital cash like Bitcoin. Holding TRX tokens provides you certain rights and privileges in the ecosystem, especially if you voluntarily have them frozen (locked) in exchange for Tron Power (TP). This will activate voting rights in Tron elections. If the TRX is unfrozen the votes become invalid until they are frozen again. TRX holders also benefitted from a BitTorrent Token (BTT) airdrop where they received free BTT. TRX can be used by content creators and Dapp developers to create their own tokens hosted on the Tron blockchain. Each time someone creates and issues a new TRC10 token they pay a fee of 1024 TRX which is then burned (permanently removed from the supply). This helps to reduce spam on the network and promotes the creation of quality tokens. TRX has appreciated significantly in value since its launch. However, its price can be extremely volatile moving in both directions so it would be considered a high-risk / high-return investment. From its launch to its all-time high in January 2018 TRX increased by more than 10,000%. However, since then its price has decreased by more than 90%. Tron has achieved a lot within a short amount of time including launching its mainnet, selecting its Super Representatives (SRs), acquiring BitTorrent and launching the BTT token, launching Tron Arcade, and attracting a large number of Dapps to its platform. 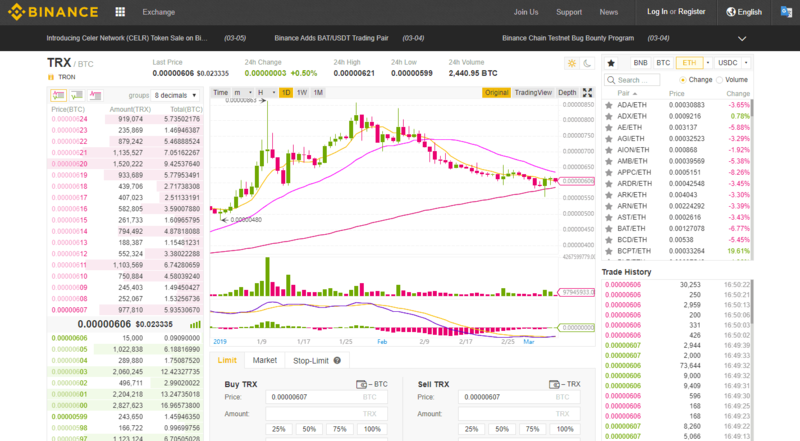 Regarding the roadmap ahead, an image which originated on Tron’s official website in 2017 has been widely circulated, but this is no longer available their site. Tron’s old website had six phases listed which can be seen in the image above, and each phase also had a description of what its goals were. This phase was the beginning of the Tron ecosystem, including its time as an Ethereum ERC-20 token. The aim was to offer its users a free and reliable platform for peer-to-peer (P2P) file sharing and storage, that would seek to liberate data. This phase aims to encourage content creation through economic incentives and empowerment. Content creators and developers will get a fair return on what they create and distribute, as well as support and exposure from the Tron ecosystem. This, in turn, will develop, strengthen, expand the Tron ecosystem. This phase will focus on personal ICO capabilities. It will address issues related to managing supporters, paying dividends, and measuring income. This phase focuses on the free movement of value. All content producers will be able to create and issue their own tokens (TRC-20 tokens). To enable this Tron must create a decentralized trading platform so that all the Tron-based tokens can be traded freely, and have access to liquidity. In this phase, Tron aims to create a fully decentralized gaming platform that is built by developers freely. This will facilitate fully autonomous gaming, predicting market functions, and the monetization of traffic. This phase will enable crowdfunding for developers to support the development of their games. Tron users will be able to invest in and back games they like, and, therefore influence the future of gaming. Improving the performance of the Tron blockchain. Introducing zero-knowledge proof to make the network safer and guarantee privacy. Reaching 10m+ transactions per day and 2000+ DApps. Mainstream exchanges will make TRX tradable with major fiats. The BitTorrent token will promote the integration and synergy between BitTorrent and Tron. BitTorrent will become the most ambition Dapp on the Tron network and will promote blockchains mass adoption. Tron will invest in the Dapp community and give projects access to exchange liquidity, infrastructure, marketing exposure, and other forms of support. Tron will open more offices worldwide. Tron states on their website that the future of the project involves developing its ecosystem so everyone can benefit from it. Dapps on the Tron network will offer users improved convenience in daily life, reduced costs, and financial returns. Likewise, developers can use Tron to bring publicity to their projects and expand the scope of their businesses. Tron says anyone who supports the prosperity and construction of the Tron ecosystem, be it the users or developers, will be rewarded for their commitment. Tron has become a leading Dapp platform in a very short period of time and has aspirations of dominating the up and coming Dapp market. Dapps that fall into a range of categories can be found on the Tron network, and recently it has been known that some Dapps are choosing to migrate over to Tron from its competitors, Ethereum and EOS. The main categories for Tron Dapps include but are not limited to: Games, Gambling, Exchanges, Collectibles, and Marketplaces. Tron was launched as an ICO on the Ethereum blockchain. Between August 31st and September 2, 2017, the project held a successful ICO. The initial token price for each Tron ERC20 token was fixed at $0.0019, and the initial funding goal was $70 million. Tron raised 100% of its funding goal while accepting deposits in both Bitcoin and Ethereum. The coin hard cap for TRX is 100 billion. 40% of these coins were distributed during the company’s public offering, 15% were reserved for a private offering, and 35% went to the Tron Foundation and the ecosystem. Interestingly, 10% of the coins were reserved for Peiwo Huanle (Beijing) Technology Co. Ltd. Note that Peiwo’s Snapchat-like app now uses blockchain and is headed by Tron founder Justin Sun. 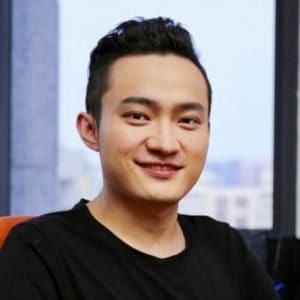 Tron is the brainchild of young entrepreneur Justin Sun who previously worked at Ripple (XRP). Unlike some other blockchain projects, Tron is mostly a vision of Sun and his interest in decentralizing the global digital media and entertainment industries. His efforts are supported by other big Chinese companies in the blockchain industry who have partnered with Tron like Bitmain and Qtum. Other partners include the Piewo App, Bixin and FBG Capital. The second most prominent member of the team is Lucien Chen, a former Tencent, and Alibaba alumnus, who leads the technical division at the Tron Foundation and has cryptography, advertising algorithms, and big data experience. Little is known about the rest of the Tron team. The Tron website states that it employs over 100 people who have previous experience working for Chinese behemoths like Baidu, Tencent, and Alibaba. Justin Sun is the founder and current CEO of Tron. He holds a bachelor’s degree from China’s Peking University, followed by a master’s degree from the University of Pennsylvania. He also graduated with a degree from Hupan University, a venture by Alibaba founder Jack Ma, becoming the first millennial to have done so. Forbes has ranked the young entrepreneur in the ‘2017 China 30 under 30’ list and ‘2017 Asia 30 under 30’ list. Sun worked for Ripple, acting as the chief representative for the Greater China region. He also founded Peiwo app, a social media app in China that streams music online and has millions of users. 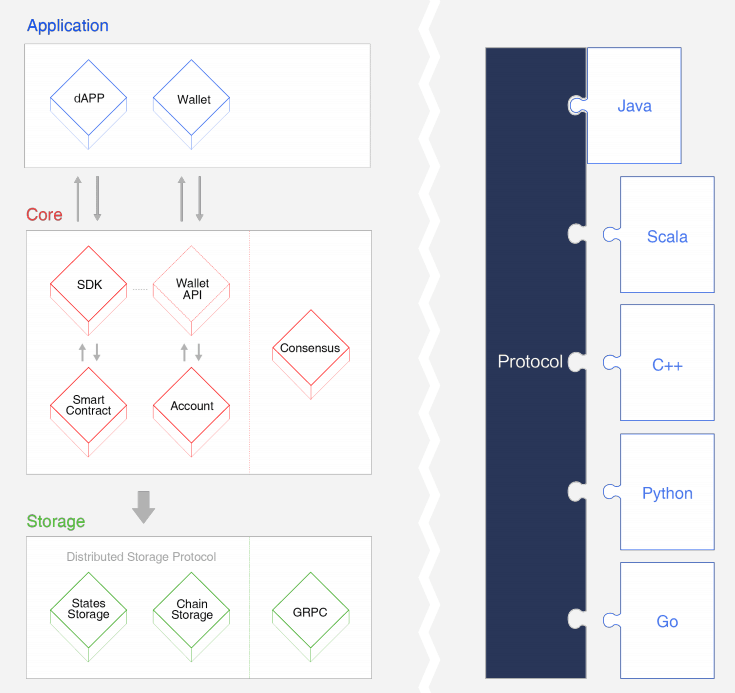 Tron has adopted a 3-layer architecture, which includes a storage layer, a core layer, and an application layer. TRON’s tech team designed a unique and distributed storage protocol that consists of state storage and block storage. The idea of a graph database was introduced to the storage layer design as it would better meet the needs of diversified data storage in the real world. The core layer has several modules, including account management, smart contracts, and consensus. A stack-based virtual machine is also implemented on Tron with an optimized instruction set used. The smart contract language is Solidity; this was chosen to better serve developers in creating Dapps. This will be followed by support of other advanced languages in the future. Tron’s consensus mechanism uses Delegated Proof of Stake (DPoS), and a lot of innovations happened to meet its unique requirements. Developers on Tron can create a wide range of customized wallets and Dapps. As smart contracts can be executed and deployed on Tron, this creates unlimited opportunities for utility applications. The Tron protocol is defined by Google Protocol Buffers, which is platform-neutral, language-neutral, and an extensible way of serializing data so it can be used in data storage, communications protocols, and more. There was some controversy surrounding Tron a few months after its ICO launch regarding its whitepaper. In January 2018, as the coin was hitting its all-time highs, the Tron whitepaper was released with English, Spanish and Russian translations. At the time, the whitepaper was accused by some of plagiarizing the documents of IFPS and Filecoin. 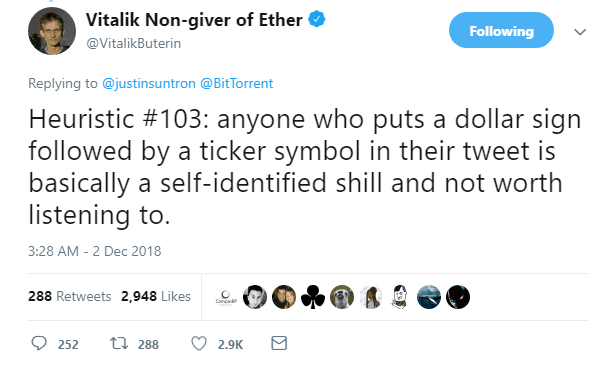 Even the creator of Ethereum, Vitalik Buterin talked about it on Twitter. Buterin’s tweet received over 8,000 likes, twice the amount of the original tweet by Sun. Justin Sun and Vitalik Buterin have clashed a number of times on Twitter and shown their competitive sides or criticisms of each other’s platforms. However, it must be noted that Vitalik seems to have lost interest recently and is not engaging as much, whereas, Sun continues to mention Vitalik fairly often in his tweets. Tron has already donated to a number of charities and seems keen to continue supporting and promoting how blockchain can be used for good causes. The TRON Foundation joined an awareness campaign to find treatments and cure for ALS, and Justin Sun donates $250,000. Justin Sun donated $3 million to Binance’s Blockchain Charity Foundation which aims to promote the use of blockchain for social good and is partnered with the United Nations Development Programme. How Does Tron Differ From Its Competition? Tron was developed on Ethereum and has since grown to challenge the Ethereum Virtual Machine (EVM) with its own Tron Virtual Machine (TVM) and smart contracts. It doesn’t just want to make the ‘computers’ like IBM; it wants to create the ‘PC’ which becomes a crazy successful consumer good in time and paves the way for the real revolution. Is Tron an Ethereum Fork? No, Tron is not a fork of the Ethereum blockchain. It started out as a project developed on the Ethereum platform with TRX launching as an ERC20 token during the ICO. 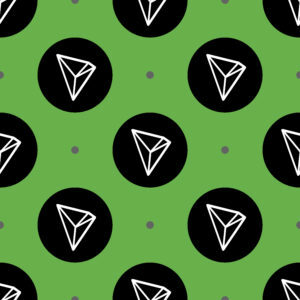 However, post the launch of the mainnet, Tron migrated to its own unique blockchain and mainnet TRX. If Tron was an Ethereum fork, it would continue using the ERC20 tokens (which are now being collected and burned by the Tron Foundation to avoid confusion) and use the Ethereum Virtual Machine. Instead, Tron has its own governance, consensus models, goals and a Super Representative program that makes it a distinct blockchain. It is interesting to note that the Tron Virtual Machine (TVM) is often called a copy of the Ethereum Virtual Machine (EVM). TVM is compatible with the EVM, but there are two striking dissimilarities between the two. Ethereum uses gas to fuel its transactions which means that users have to incur a fee (or spend coins) to make transactions. Tron works on a new idea called bandwidth, which makes smart contract operations on the blockchain free. However, users have to stake TRX after a select number of free transactions, fixed at 25. Secondly, TVM doesn’t have scalability issues like EVM. 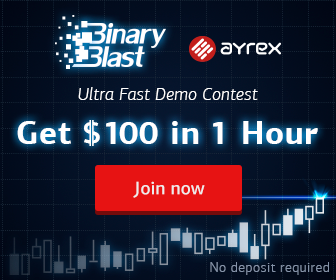 It is a high-thought put blockchain system which can handle thousands of transactions per second. As far as compatibility is concerned, TVM will be made compatible with other prominent blockchains like EOS in the future. Tron is already has a large number of partnerships and always seems to be announcing new developments and projects helping it to create a rich ecosystem. The multinational bike sharing company with over 10 million users partnered with Tron to launch its own cryptocurrency ‘oCoin’ using the Tron protocol. Users will be able to ride oBikes and earn oCoins, which can be used to pay for future rides. oBikes has created a loyalty program where the more the bikes are used the more coins that are earned. The oCoins can also be used in the wider Tron ecosystem. China’s search giant Baidu, a multi-billion-dollar homegrown enterprise partnered with Tron. However, the partnership caused some controversy as some claim that Justin Sun overhyped the new deal, which only involves the use of Baidu’s cloud resources by Tron rather than anything at the blockchain-level. The shining jewel of Tron’s ecosystem, BitTorrent, has over 100 million users. Though it is not a ‘partnership,’ but an acquisition, it’s fair to say that BitTorrent will play a crucial role in driving the mass adoption of Tron and blockchain tech. The BitTorrent token (BTT) is a TRC-10 token that will enable users to pay for faster downloads on the peer-to-peer platform. Tron’s native token TRX has a limited supply. Unlike some cryptocurrencies, especially stablecoins, which do not have a hard cap, TRX holds some scarcity value. There was a total of around 100 billion TRX tokens released initially by The Tron Foundation. However, later, in June 2018, the Foundation burnt 1 billion coins worth over $50 million at the time, bringing the total supply of TRX tokens down to around 99 billion. About 66.5 billion of the TRX supply is in circulation as of now (March 2019) and the remaining 33 billion TRX held by the Foundation will stay locked until January 11th, 2020. Tron Power – Can I Mine TRX? Tron Power provides users in the ecosystem with special rights. As long as a user is willing to stake some of their TRX coins, an equivalent amount of Tron Power will be given. However, holding Tron Power tokens does not make you a miner. It only gives you special voting rights in the ecosystem. TRX is a pre-mined currency, which means that it is fundamentally different from Bitcoin and Ethereum. With BTC and ETH, block producers or miners receive rewards for creating new blocks. However, with Tron, all the tokens are already mined, and about 65% of the available TRX is already being traded freely in the open market. How Much Is TRX Worth? TRX is an extremely low-priced cryptocurrency. When it was first launched as an ERC20 token, each TRX was worth $0.0019. On January 5, 2019, TRX peaked and traded at an all-time high of $0.35 with a market cap of $16.75 billion. TRX is currently trading (March 5, 2019) at $0.024 with a market cap of $1.57 billion making it the 10th largest cryptocurrency. How Can I Store TRX? Tron has a large list of wallets that support TRX listed on its website. This includes Tron community developed wallets and Tron-dev collaboration wallets. Most cryptocurrency exchanges that offer TRX trading will have there own built in TRX hot wallets where you can store your TRX and other cryptocurrencies if you are actively trading them. Which Is the Best TRX Wallet? The Ledger Nano S could be considered the most secure hardware wallet for TRX. The hardware wallet looks like a USB drive and comes with a small touchscreen. A popular and secure choice for a mobile TRX wallet would be Trust Wallet. Trust Wallet is the official crypto wallet of Binance. And Binance and Tron have a very close relationship, often collaborating on projects, so its no surprise TRX is supported here. TronLink is a great choice for a browser wallet for TRON. It enables users to receive and send TRX, as well as TRC10 and TRC20 tokens. Developers are able to integrate TronLink into their websites for creating Decentralised Apps. Developers are able to integrate smart contract calls, which enables the use of decentralized applications from within the browser. Where Can I Buy or Sell TRX? The common way of buying Tronix (TRX) is from a cryptocurrency exchange that has TRX listed. TRX can be bought with a credit card directly on CoinSwitch, the cryptocurrency exchange aggregator, and Changelly, an intermediary between crypto exchanges and users. Another option for buying Tron with fiat currency would be to deposit money into your Coinbase account, purchase Bitcoin or Ethereum, then send this to another exchange where TRX is listed and exchange the BTC or ETH for TRX. 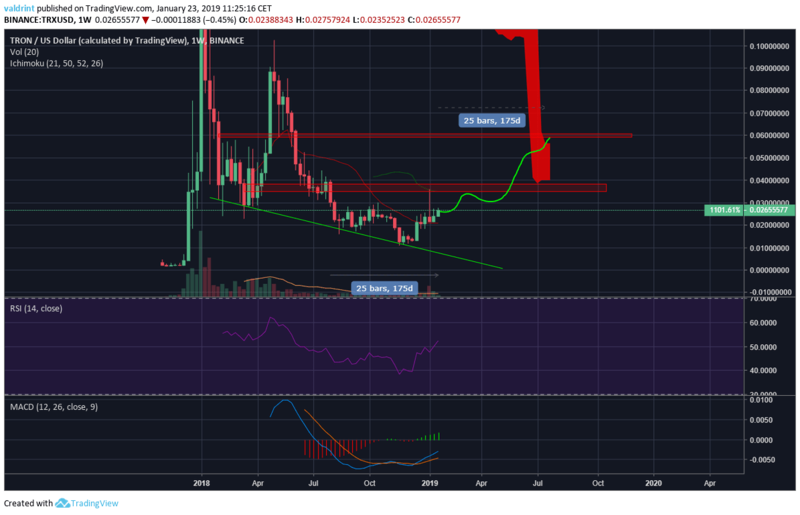 Our in-house technical analyst believes TRX could hit $0.06 by the end of 2019. The full analysis and price predictions for the top 10 cryptocurrencies including TRON in 2019 can be found here. Tron is definitely a blockchain-based project that has a lot of potential. It has proven time and again, through a multitude of partnerships and successful acquisitions, that it takes its vision of decentralizing the web and becoming a platform for the creative industries seriously. 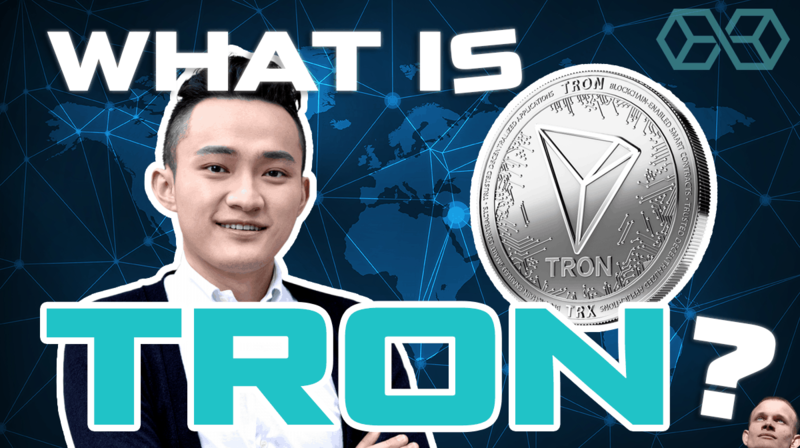 Tron is also extremely good at marketing itself and is constantly keeping its community up to date and engaged with fresh content, news, and announcements either via the Tron Foundation’s blog and social media accounts or Justin Sun’s accounts. Tron Foundation on Twitter (390k+ followers) and Facebook (1m+ likes) and medium. Tron has an evergrowing number of DApps on its platform, and you can be sure they will continue to focus on expanding this, with the aim of becoming the leading DApp platform. The DApp industry is still very new, but as it continues to develop and go mainstream this will be a huge opportunity for Tron. Tron also has its $100m gaming fund called Tron Arcade. The aim of the fund is to empower developers to create the next-generation of blockchain games. Gaming is already a hot sector and if Tron can position itself as a leader in the growing blockchain gaming niche, this again would be a massive and potentially lucrative opportunity for Tron, and hopefully the TRX holders. Justin Sun has outlined that he wants to see TRX become a top 4 cryptocurrency by market cap in 2019. “Tron to the future, always moving forward,” says Sun, and if they can achieve the goals they have set out, then 2019 could be quite the year for Tron. r/Tronix Reddit – The purpose of Tron Token? r/Tronix Reddit – Is it possible to mine Tron/TRX? 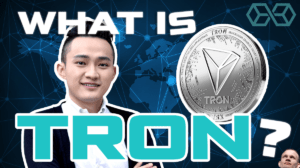 Developers.Tron.Network – What is Tron? What is TRON? What is TRX? A Must-Read 2019 Guide Packed Full of Info was originally found on copy trading cryptocurrency | Blockchain News | Bitcoin News | blokt.com.